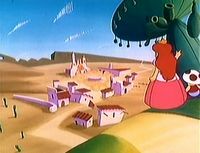 El Desert Land is a desert in The Super Mario Bros. Super Show! episode "The Mark of Zero". This desert also has a small town with Mushrooms as the citizens. Outside town, there is a mexican food restaurant. The town and desert's hero is Zero and she is a very mysterious person to the citizens of El Desert Land - she was even thought to be a male at first. El Desert Land which looks like an old Mexican town was attacked by El Koopitan in the episode. Coincidentally, a few months later Super Mario Bros. 3 was released and that game had a world called Desert Land. This world's name was very similar to "El Desert Land". This page was last edited on February 16, 2018, at 22:31.